Do you know a "Charlie Muttnik" -- a child that is always drawing, creating, playing, and imagining? Charlie Muttnik, the main character in I Gotta Draw, doesn't know why he draws all of the time, but he knows it is all he wants to do. Unfortunately, his house is cramped and busy and no paints are allowed. He has to search for a quiet and comfortable place to draw, "I draw at the kitchen table (only to get chicken soup on my picture), in the living room (only to get squished by my sister on the couch), in bed (only to be told by my mom that I need to go to sleep), sometimes it seems there is no place at all." Will Charlie Muttnik's love of drawing fade away or will someone take the STEPS to nurture and foster his artistic ability? 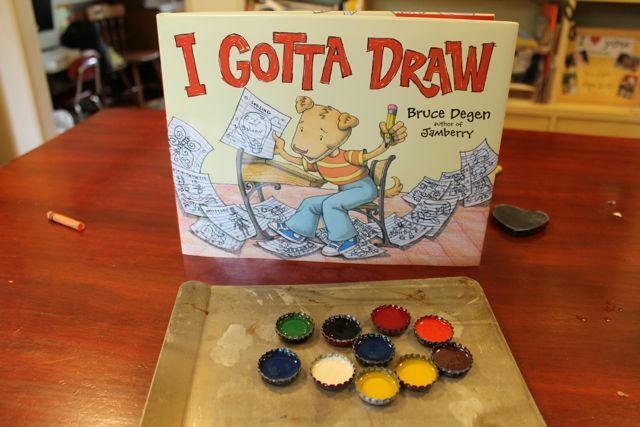 Bruce Degen is the author and illustrator of numerous picture books including Jamberry and Daddy is a Doodlebug. He teamed up with Joanna Cole to create The Magic School Bus series , illustrated the Commander Toad series of early readers by Jane Yolen, and the Jesse Bear series by Nancy White Carlstrom. 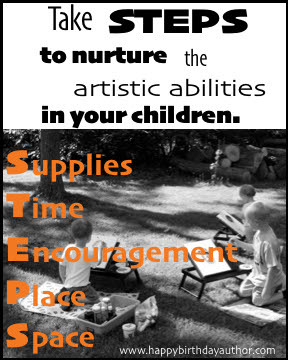 He was asked how parents can nurture and foster artistic abilities in their children, "The one thing I would advise is to have different materials around the house appropriate to the kids' age and just let them draw. Give them time, give them a place to work. Stay tuned. If they want to, they will ask for more." (Cynsations). 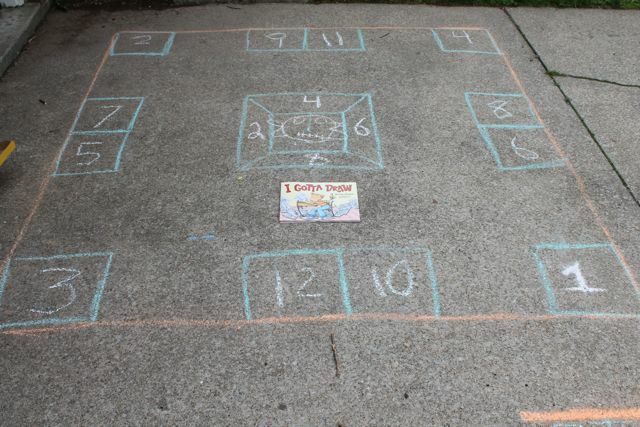 In Degen's I Gotta Draw it is Charlie Muttnik's teacher, Miss Rich, who takes the first STEPS to nurture his abilities. She provides the SUPPLIES Charlie needs to draw -- pencils, big paper, and a set of paints and brushes. 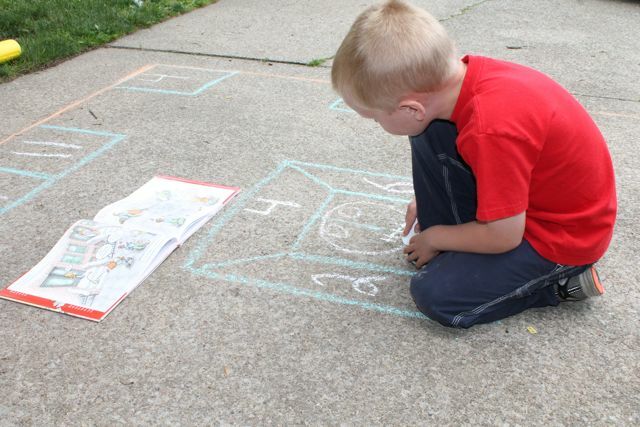 She provides the TIME for Charlie to draw -- he can draw during spelling and social studies classes as long as he still participates in the lesson. She provides the ENCOURAGEMENT Charlie needs to improve, excel, and feel successful in school. She provides a PLACE for Charlie to work -- a empty blackboard at the back of the classroom. She provides the SPACE for Charlie to express himself without pressure and judgement. For Degen I Gotta Draw was very autobiographical. (Mazza Museum Keynote). Just like Charlie Muttnik, Degen said, "I always, always drew, as early as I can remember." (Scholastic). His love of drawing lead him to chose a high school that specialized in art and later received a Masters of Fine Arts from Pratt Institute. He felt spending the rest of his career as an artist in an fine art gallery would be as stifling as Charlie Muttnik's small apartment. "When you go to a gallery, very rarely do you walk around and see people chuckling and having a good time. I decided to do children's books because they make you laugh." (Scholastic). 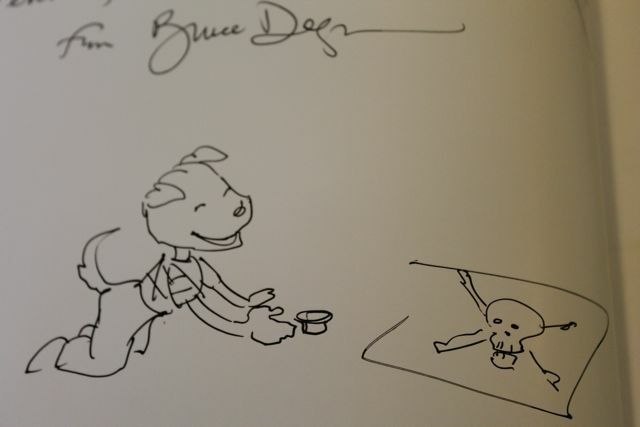 There were many teachers in Degen's life that took STEPS to foster his artistic ability including Renee Devlin, for whom the book is dedicated. She was Degen's boss when he taught at Beach Channel High School in New York City. "She showed me what it was to change kid's lives by recognizing talent and helping them develop their skills, and inspiring them to go on to art schools and win scholarships, or else just be forever enriched by the development of their talents." (Cynsations). 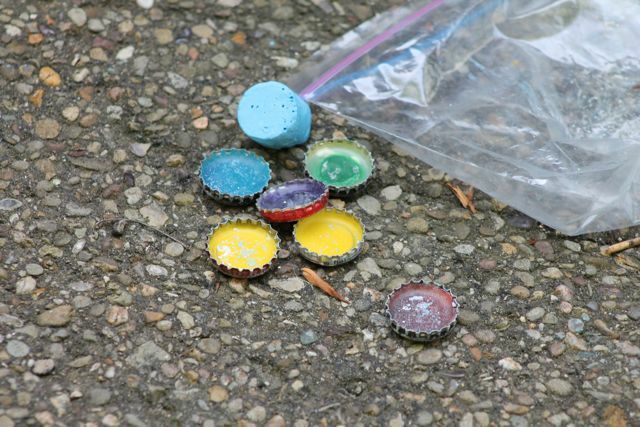 Bruce Degen said in his keynote speech that he would melt crayons in bottle caps to make them different colors for each player. My children picked the color they wanted for their bottle caps from our crayon basket. I placed a cookie sheet on the stove top set at medium heat. 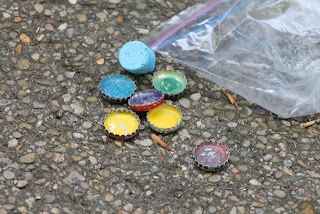 Then, we broke pieces of the crayon and set them in the bottle cap. 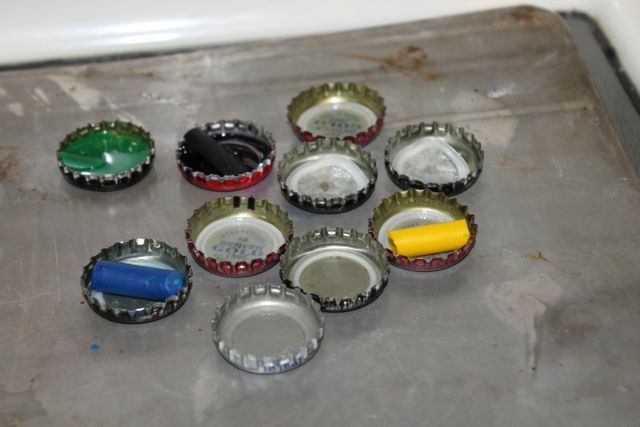 If you notice, some of the plastic liners on the bottle caps melted as they sat on the burner. We carefully removed those before adding the crayons. Once all the crayons melted, we removed the bottle caps from the stove top to allow them to cool. While we waited for the game pieces to cool, we went out to the driveway to draw our Skelly board. 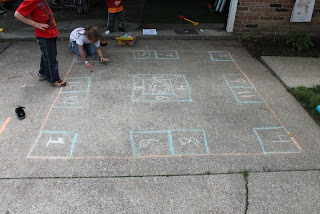 We found directions for creating the board on Streetplay.com. 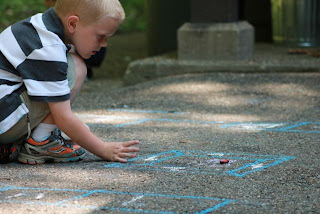 In this photo, my son drew the skull in the middle of the board. The object of this game is to flick your game piece to all the numbered squares in order from 1-12 and then into the SKULL center and then back again (12-1). But, be careful because you can get stuck in the trapezoid spaces around the Skull and other players will try to throw you off track by blasting your piece "out of town"! 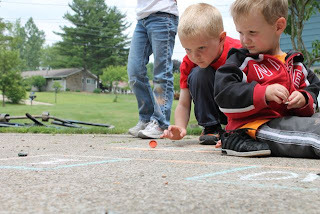 If you complete the course and remove all the other players from the game by striking their bottle cap three time the you are the winner! 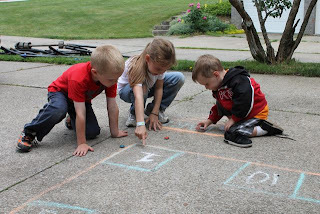 My kids loved this game! 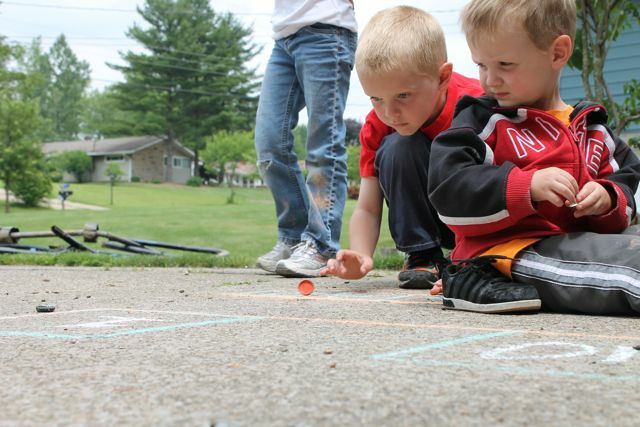 Look at the concentration! The little guy was able to play too with a little help from his big sister! My wife said, "You have been playing that game for over an hour!" My kids said "Because it is awesome!" 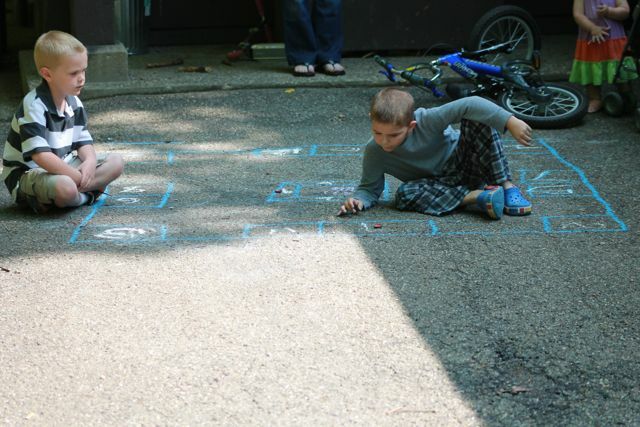 It was so awesome that they wanted to take the chalk and game pieces on vacation with their extended family to show their cousin how to play. 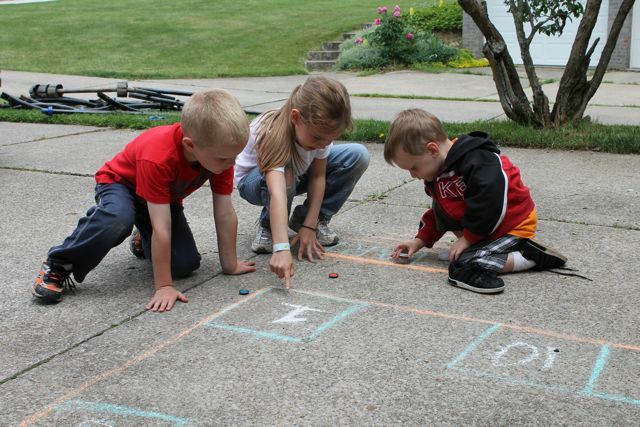 It was really cool to watch them recreate the Skelly board and teach their cousin how to play. 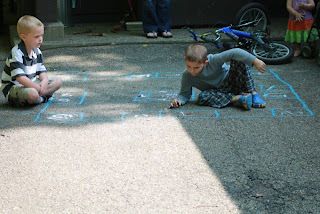 My nephew ended up winning the Skelly game. 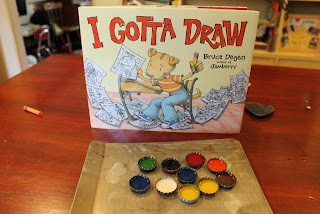 On this trip he told me something that was very fitting to our reading experience based on I Gotta Draw and birthday celebration for Bruce Degen. He told me that he asked his mom and dad for his own art studio for his birthday (which isn't for a couple months), but they already surprised him with a space to do his drawing in a spare bedroom. 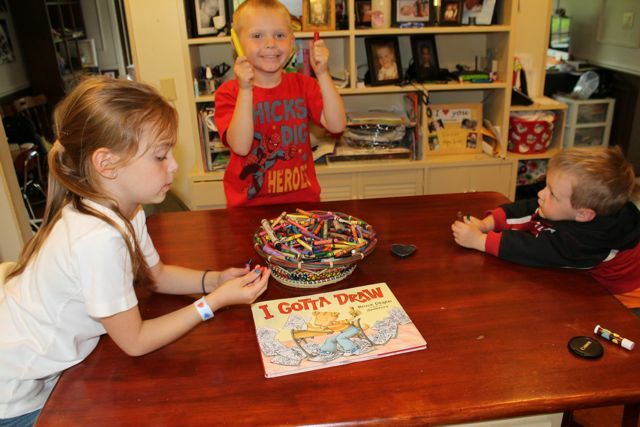 He has a desk and lots of art supplies! I was so excited for him and proud of my sister and brother-in-law for taking the STEPS to nurture and foster his artistic ability. "STAY TUNED!" 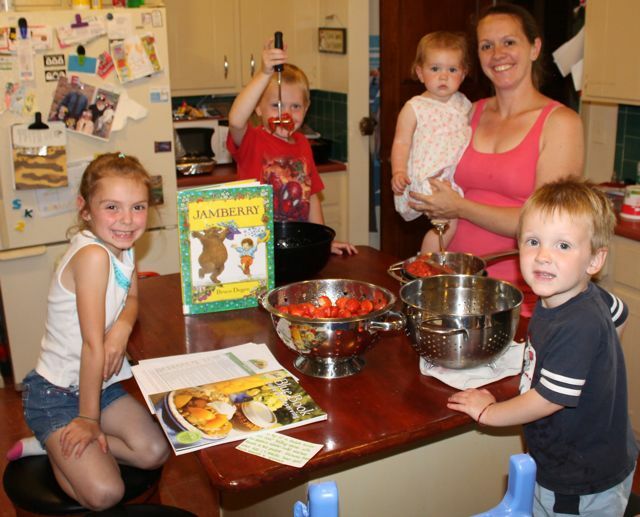 This week, (June 17, 2013) berry picking season began in Ohio. I saved reading Bruce Degen's Jamberry until we had a chance to take the family to a berry farm. We picked 20 lbs. of strawberries and used many of them to make strawberry jam!! Bruce Degen said in the author's note of Jamberry, "When I was a little boy, berries never came from a store. We found them in the fields. Grandma would take a pot, Grandpa would take a can, and I would take my pail. We picked and picked and didn't come home until we had filled them up with berries. 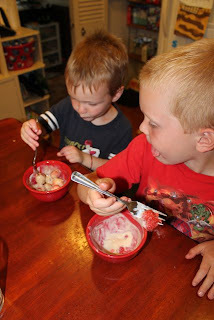 Then we would sit in the kitchen and eat fresh washed berries with sour cream and sugar." I mixed equal parts brown sugar and sour cream. Then added a bunch of strawberries and my boys loved it!